To say that Jean Hofstetter was and is an athlete is an understatement. Using a hackneyed cliché of the day, she has done it all. Player. Coach. Umpire. Administrator. Author. Rules Interpreter. Official. She has done all of these things at one time or another in her life and has done several simultaneously during her career. 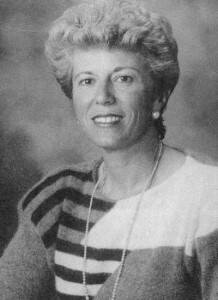 Hofstetter’s athletic career started in Orrville High School, where she played basketball from 1955-59. (This overlapped the time Bob Knight was at OHS and it’s been said that they used to play a little on-on-one.) She also played basketball and golf at Ohio State University, graduating in 1964 with a B.S. in Education. For fifteen years (1970-84) Jean played Fast Pitch Softball in the Ashland area. She was a pitcher (213-103, ERA never over 1.78, under 1.00 four times), an outfielder, and infielder (1st base), carrying a batting average over.300 for eight years (.341 in 1975). Named to various State, Regional, and National All-Star teams, she was on teams that played in seven national tournaments, finishing second in 1977 and fourth in 1978. Her teaching career spans a period of fifteen years also with stops in Orrville; Long Beach, California; Mapleton (Ashland County); and Ashland College. During this time she also picked up a Master’s Degree in Guidance Counseling. This took her to jobs in Counseling and Job Placement in Delaware and Marion, Ohio. Coaching jobs have included Basketball, Softball, Swimming, Track and Field and Volleyball. Teaching subjects have included Health and Physical Education, English, History and Political Science, Dance, Team Sports, Individual Sports, and others. From 1970 to 1978 Jean was a player-coach of women’s AAU basketball teams in the Cleveland and Columbus area. She played in three National AAU Basketball Tournaments in Gallup, NM. –Rules interpretations for all sports. –“Fast Pitch Softball Pitching” (1980) (A series of six articles). Jean Hofstetter is now a Financial Planner and Investment Broker in Pittsburg.